The Fitline 100 Treadmill offers a simple, yet effective workout to help maintain your health and fitness all year round. The 3 levels of manual incline allow you to work a range of muscles and burn extra calories. Incline training raises the heart rate and improves your fitness faster. The 12 Built-in Workout Programs are designed to keep you motivated, encourage you to achieve fitness goals and to reach new limits. The 1.5 HP Motor combined with a large 42 x 122cm walking surface gives you the confidence to move freely, without constraint. There is no need to pause your workout to re-hydrate, the Fitline 100 is built with 2 water bottle holders, conveniently located on the console. See your fitness level improve and track your progress with the Easy To Read Console, giving active feedback on Speed, Distance, Pulse and Calories burnt. 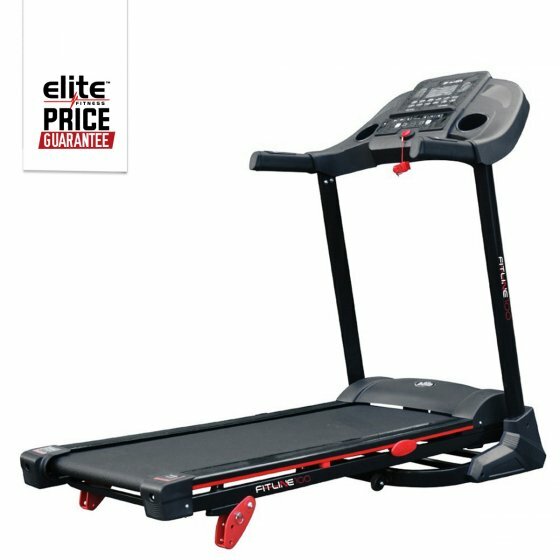 Elite Fitline Treadmills epitomize the very best value for money, without compromising quality construction and key features. Enjoy the convenience of exercising at home, on a treadmill that suits both your fitness goals and your budget. 12 Built-In Programs: Stay motivated using the built-in workout programs. 16km/h Speed Control: Conveniently located on the handlebars made for easy and quick speed adjustment. Shock Resistance Deck: Reduces the force and impact that goes through your joints while walking.